The second in a series of articles about priesthood quorums and their purposes. Here members of the Presiding Bishopric share some thoughts about teachers quorums. How can the quorum help individuals become spiritually stronger, especially during the critical teachers quorum years? Bishop H. David Burton (above center), Presiding Bishop: Our young people need the opportunity to feel the Spirit in a Church setting. Imagine what it means to have a young man kneel with his peers around a classroom table, or whatever the forum is, in humble prayer. This practice can make a big difference in the lives of young men. 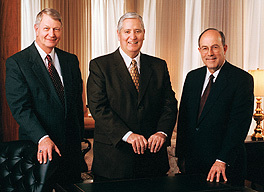 Bishop Richard C. Edgley (far left), First Counselor in the Presiding Bishopric: Think what it does if they kneel in prayer for another quorum member who is sick or has gone astray or is having a problem. It starts to build the brotherhood these boys ought to be feeling. At these young men’s age, so often their friends are most influential in their lives. We would like them to have friends in the quorum with whom they have spiritual experiences, with whom they share support, and with whom they develop a real brotherhood. Bishop Burton: It’s one thing to have a quorum adviser call to inquire about a quorum member’s welfare. It’s quite another to have his quorum president visit or call. What were some of your early assignments (see D&C 20:53–55) as a teacher in the Aaronic Priesthood? Bishop Keith B. McMullin (above right), Second Counselor in the Presiding Bishopric:I remember my first home teaching assignment was with a brother from Scandinavia who spoke broken English. He called me on the phone, and I tried hard to understand what he was saying. He invited me to come to his home. He was an older man, a very fine Latter-day Saint, and my senior companion. He invited me in and said in a heavy accent, “I think we should say a prayer.” We knelt down and had a prayer. At that time in my home, our family prayers were reserved for major occasions﻿—they weren’t an everyday occurrence. My home teaching companion, however, placed prayer into a much different category for me. I thought to myself, “Home teaching is really important, and prayer is an important part of home teaching.” And of course I learned what a wonderful, precious experience it is. Bishop Burton: I can remember how frightened I was the first time I was assigned to go home teaching. My companion was a less-active Melchizedek Priesthood holder, but he was a faithful home teacher. When we went into the homes of the people, that tough, large, rather rough-appearing man was as meek and mild as anyone could be and always insisted that we kneel in prayer with the families. He was a marvelous human being who taught me﻿—a young teacher﻿—how to be a home teacher. You have talked about the important role of youth in quorum leadership. What about the role of adult leaders in a quorum? Bishop Edgley: You’ve got to include the bishopric. It starts there. I like the counsel President Thomas S. Monson, First Counselor in the First Presidency, has given. He said you talk with your counselor responsible for the deacons and tell that counselor to make sure every single deacon becomes a teacher. You talk with the counselor responsible for the teachers and tell him to make sure every teacher becomes a priest. As bishop, you say, “I’ll take the priests. I’ll make sure every one of them receives the Melchizedek Priesthood.” It can be done; it has been done. What are some of the biggest challenges teachers face today, and how can we help them stand firm? Bishop Edgley: A boy this age wants his independence. He’s testing his parents and is trying out his freedoms. That is one of the reasons the teachers quorum has to make sure his freedoms fall within the right sphere of friends and the right environment. Bishop McMullin: There is a window of receptiveness in a young man’s life when he is 12 to 15 years of age. Young people this age are often more inclined to wonder about patriarchal blessings; they are more inclined to wonder about the Book of Mormon. This is a pivotal period. Bishop Burton: If the sail is set, the course will be right. If a family has a long tradition of having family home evening, if they have even cursory gospel study in the home, and if they gather together on a regular basis to pray in the home﻿—that is a great advantage. Parents should do everything possible to accomplish those three things. That is the best insurance policy they can have.